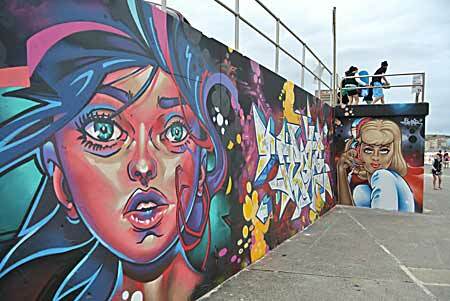 Alcohol restrictions ‘down south’: A sober slide into 2013 on Bondi Beach. 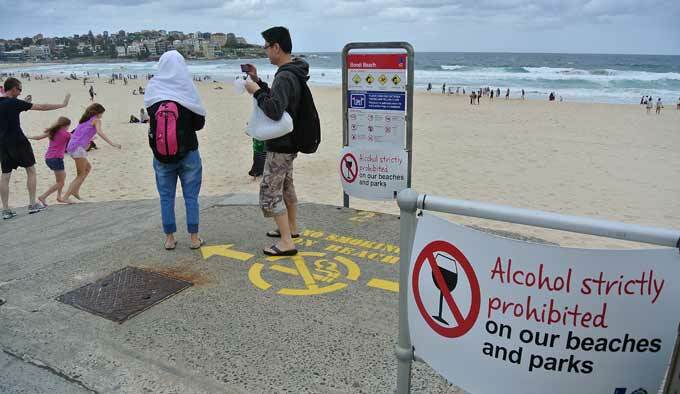 ABOVE: Signs prohibiting smoking and drinking alcohol on world famous Bondi Beach, bans brought in by local government after “riots”. CENTRE: Australia’s best known beach. BOTTOM: Wall art is part of re-badging the beach as a place for families. If you’re inclined to scream “Why Me” every time you hear the word alcohol restrictions, take some comfort from how Australia’s most famous beach and former venue for wild New Year’s Eve boogies is dealing with the issues. Not only is alcohol completely banned from Bondi Beach at all times, but so is smoking. The clamp-down was put in place with the overwhelming support from the locals after what Waverley Mayor Sally Betts describes as “riots” by drunks. Tomorrow there will be alcohol at Bondi Beach to usher in 2013 but only in a small, fenced and highly controlled area and not near the water. Alcohol free zones were brought in from 2004/05 as what Mayor Betts, whose council has taken charge of the matters booze abuse in public, calls “the sober centre campaign”. “We had some pretty bad riots,” she says. “One year, because we had no controls and people just got completely drunk, out of control, they pushed over a bus, the police were attacked, it was a really bad, bad thing. “Christmas Day on the beach. You would see them coming down, bringing a lot of alcohol. It wasn’t to stop mum and dad having a glass of wine, or having one beer. The council some years ago put out to tender the running of the function where alcohol is sold, and the successful company, MI5, is now running the Christmas Day and New Year’s Eve functions at Bondi, as well as an elevated park from where the fireworks over the city and the Harbour Bridge can be seen. There is no BYO. When people leave the enclosure they cannot re-enter – so it’s less likely that drunks go for a frolic on the beach and then head back for a top-up. MI5 security, council rangers and police are making doubly sure of that. However, patrons can leave after drinking and go for a swim: “That is our biggest worry,” says Mayor Betts. MI5’s additional obligations are to tidy up the surrounding streets. In fact the 3am closure has this year been wound back to 2am to lessen the influx of drunks from the city after watching the midnight fireworks, and the noise has to be turned down from 1am. The council blocks off the streets, works closely with the police and the Sydney public transport buses taking people to and from the venue. There are not many arrests but booze is confiscated by police or the rangers, when it is found on the beach. The grog and smoking measures aren’t something the council came up with on a sleepless night. The Waverley Municipal Council, local government for a population of 64,000, has an all-embracing system of consultation with 13 precinct committees which hold meetings every couple of months and which any precinct resident can attend and speak at. Also, council officers and the local ward councillors are likely to attend the meetings. The precinct committee minutes are put on the council website. It was the Bondi precinct committee which pushed for the restrictions, with supporting business one of the objectives. “Most of the residents accept New Year’s Eve is going to be a big noisy event, and it’s fun, and as long as the kids don’t drink too much and it’s controlled the police seem relatively happy, too,” says Mayor Betts. Alice Springs, Bondi beach, the South Coast of NSW from Moruya to Bega: I just come back from my sea-side holidays. On every beach, the sign, new but clear: No Alcohol on the beach from 8pm to 8am. Heavy fines if and when caught. So no more binge around a campfire on the beach even with roasted marshmallows, as has been the case till now! Goes to show that alcohol abuse is everywhere, therefore alcohol restrictions too. During the day, most beaches are under the watch of life-guards. At night, not much difference between a creek-bed and a beach. Is reasonable to provide various communities ability to enforce restrictions on public drinking and intoxicated activities, provided this ability does not interfere with the ability of individuals in their homes to enjoy a drink. Imposing such restrictions upon activities within homes need remain tasks for the courts. Those who seek such imposition need present their request to court with reasoned argument as to why such imposition necessary with what benefits such imposition shall achieve. Judicial consideration provides ability respondents to persuade such impositions not required. Judicial determinations to impose such restrictions remains subject to review. Why needs it be otherwise?